That is what String, Straight-edge and Shadow does. It shows us what we don’t realise we know, what civilisations before us learnt and passed down to us. It brings an awe and magic back to our learning. The String, Straight-edge and Shadow positions us in the eyes of those that lived in the Ancient Middle East. It takes us on a journey through the development of knowledge about the physical earth and with it the stories of civilisations and their figureheads that prided themselves on that knowledge and search for truth. What the ancient Egyptians experienced as parcels of land, are the shapes we learn in a classroom. Our learning of maths comes as abstract concepts sometimes lacking in real world applications. But follow the development of geometric understanding through this book and it’s like plotting a possible curriculum of maths through a childhood. Suddenly I understand the shapes that arose from dividing land and how they came to see shadows as messages from the sun to keep a track of time, and in turn use that as a direction for travel. With the power of hindsight (eg history!) String, Straightedge and Shadow pieces together what appear to be insignificant events into an arching narrative of civilisation’s evolution. This type of development has always been at the forefront of a civilisation’s growth, today we call it science and maths, then it was knowledge that was needed to ensure life prevailed. These ‘rope-stretchers’ were held in esteem as the celebrities of Mesopotamia and often given Pharoah status. Like the IT wizards of Silicon Valley today, the ‘rope-stretchers’ of ancient Egypt forged a way into the future. In a world of 24hr electric lighting and GPS its hard to imagine life without either of these. And like I said, we need almost to forget what we know to see the importance of what this book can tell us. But it is flippant of me to say that. This book constructs the very real situation that the ancients may have found themselves in and asks you, the reader, to put yourself there for a moment. After the Egyptians came the Greeks who spent much time ‘thinking’ about geometry. 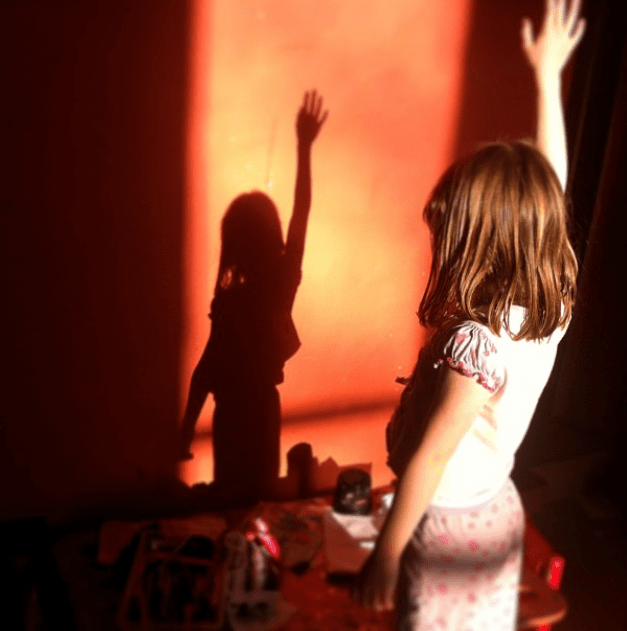 Their love of knowledge pushed them to ask many ‘Why’ questions about life and the universe. They inherited the learned knowledge of geometry from the Egyptians before them and they brought to it questions about the world. This ‘thinking’ about geometry took on, big time! So began the use of abstract representation of shapes and deductive reasoning. Just to write it like that seems like such a leap from what came before. But that is what this book is so good at – it lays out the pursuits of the people who made the biggest impact on this slow, gradual change and makes it understandable. This is an important fact to grasp. Making the connection between what we see and how we ‘think’ about geometry. Would many of us find understanding concepts easier of we demonstrated it first? Today we pursue academic geometry in an abstract way, on paper and in our minds. This of course is a valued step in developing thought processes. But real life applications have the benefit of demonstrating shape problems much as the Egyptians experienced them first, as a necessity to life. Greek life was filled with myths and legends, cults and superstitions. This is where geometry went next. These now established rules of abstract geometry became a power to be guarded. Like the TED talks of today, demonstrations of geometry, number and what appeared to be magic were events much-anticipated but only for those initiated. Enter Pythagorus and his Secret Order. The pursuit of knowledge was their goal. And from here we get our common term ‘maths’. 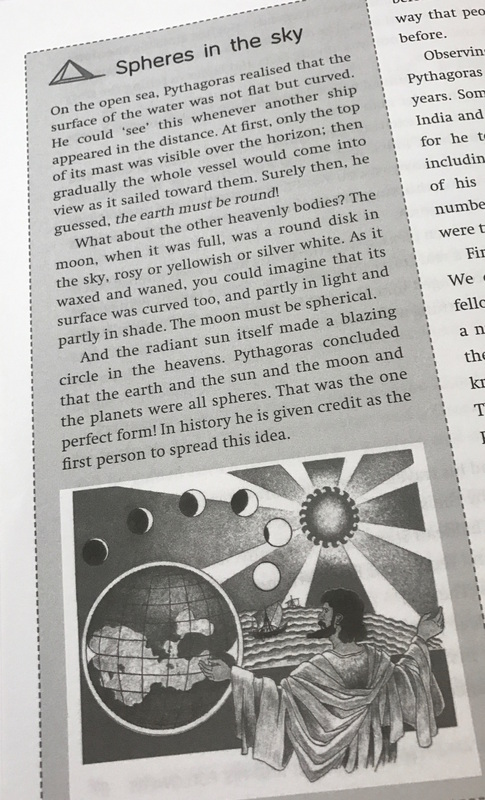 Pythagorus gave talks on ‘mathemata’ which then meant ‘studies’ inparticular the curious combination of geometry with the cosmos. Great theorems came from this era and still hold today. Still at this point, its worth remembering any figure who advanced the knowledge of number and geometry spent much of their young lives studying its birth and understanding the importance of the stars to the Egyptians. Those that advanced knowledge of geometry had a grounded and practical understanding of where it came from. This book helps us to do that. To catch up on that understanding and positioning us now, as a student of geometry, in the correct mindset to take our place in the development of geometrical thought. We have to know where we have come from to project into where we are going. Cosmic meanings, regular solids, music intervals, triangular and square numbers, golden section in architecture are all included in this part of the story. Yet the Pythagoreans hid one thing – their lack of understanding about irrational number. (spoiler alert!) This was to be their downfall yet to the benefit of others. The Golden Age dawned and perfect structures abound from this age where geometry was art and geometry was life. This era has left a big imprint in world cultures from its gains in geometry. From the Golden age, it seems just a small step in understanding for them to be able to achieve the climatic goal of calculating the size of the earth. So began the mapping of the Mediterranean and the bringing together of lands in trade routes. Of course we can’t forget Euclid (as much as I might try!) whose legacy still echoes today through our text books. He painstakingly compiled the rules and laws of geometry through reasoning and proofs. This was upheld by philosophers, lawyers and theologians as the path to their truth and to our understanding of the geometry’s history. Be it Thales, Euclid, Archimedes or the others that feature in this book, these Geometers were kings and heroes who launched academies and schools and led armies because of their knowledge. Let us not forget that knowledge was guarded then, it was not for the everyman. But now you too can be a hero, just follow the story of the pursuit of truth and knowledge that String, Straight-edge and Shadow has to offer us. 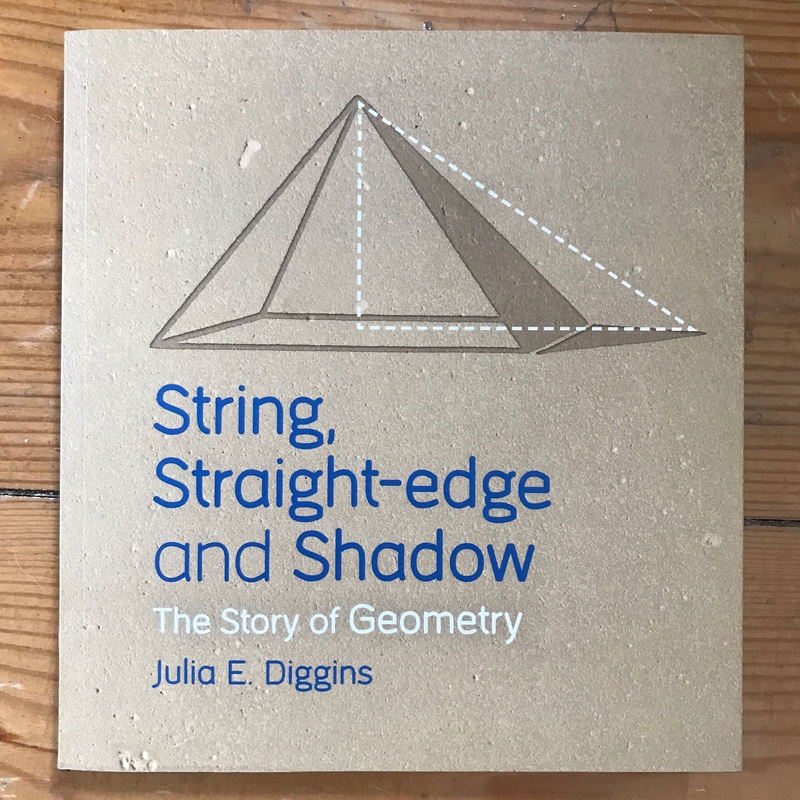 String, Straight-edge and Shadow published by Floris books – out Now!